There is a lot of buzz in the printing industry over “digital embellishment”, “high build spot UV”, “raised UV”, and “3D spot UV”, all different phrases that mean near enough the same thing. But what is it and why is it better than conventional processes? For many years commercial printers have added a high gloss spot UV over text and images to highlight, and make images “pop” off the page. Traditionally, this process was done on screen press equipment. This required not only the screen press equipment, but the technical know how and capability to make screens. The screen presses also require lengthy set up times and skilled operators. For these reasons, many printers sent their work out to trade finishers who charge set up fees for such jobs, and there was time and expense for their service. A smaller minority of printers had their own screen press equipment in house and ability to make screens. But even they still dealt with the frustration and expense of one hour+ set ups, and the technical requirements for achieving good registration. However, with the increase in volume of print being produced digitally, on demand, the demand increased for a new technology that printers could do in house, with very little make ready time, and ease of operation. Since many Autobond customers were first laminating, before going to a screen press, we saw great potential for using ink jet technology to apply spot UV varnish, in-line with our laminators. 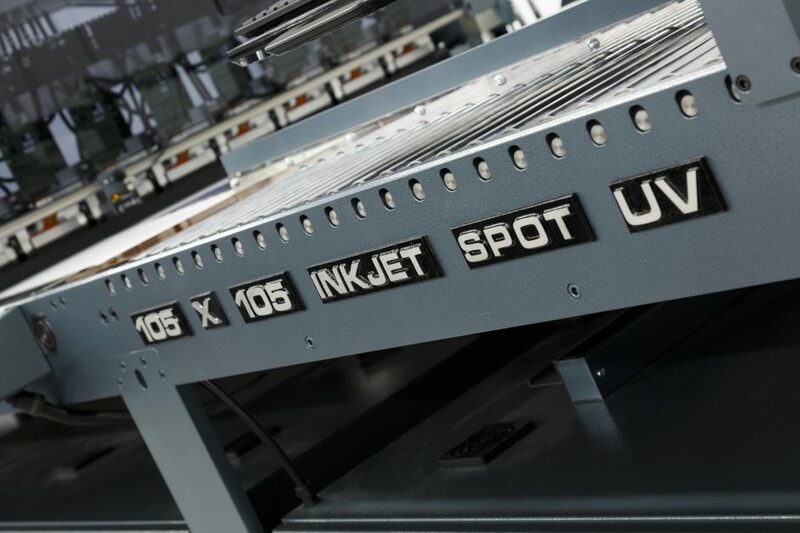 Our modern ink jet spot UV systems allow the user to upload an image file to the machine, which dictates to the ink jet heads where to print the high gloss spot UV varnish. Our machinery enables our customers to matt laminate a sheet at high speed, spot print a high gloss, high build (or raised) UV image over the top of their printed image, adding a textured feel, and high gloss look to their print. But why is it better than conventional screen UV? The productivity and format range Autobond ink jet spot UV machinery offers makes this viable for more than just digital printers, this is a solution perfectly suited to offset printers as well. Keep checking our blog post for upcoming developments: Adding foiling in-line with our existing laminating/in line ink jet spot UV machines!